In the meantime you can read an article here on what might happen today. I don't agree with the article though that protesters have been "whittled down"; they've simply changed strategies. Protesters in large groups at pre-arranged locations have been shown to be no match for armed police and thugs, and so the last few protests have been more sporadic, with shouting of slogans for a while, then breaking up when security shows up, only to regroup somewhere else. Okay, here come the reports. 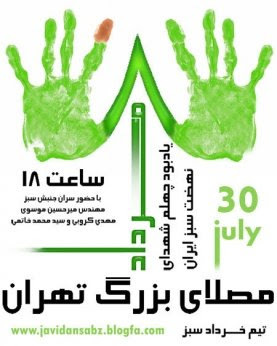 Mousavi has been forced to leave the cemetery where the protest was scheduled, but the LA Times has just reported that protesters have overwhelmed security forces and have been able to enter. Apparently security made Mousavi return to his car, and if he's still there perhaps he'll still be able to enter later on. Also, take a look at Twitter's trending topics right now. There's #Iranelection right at the top where it belongs. Lots of videos available now. Here are two from the cemetary. This video also from Valiasr is probably the most memorable one today. Note especially the unarmed young man fighting back against the armoured goon at 0:20.